On our event floor with app. 2.000 sqm you will not only find seven event rooms for 8 up to 500 persons, we also can offer a very big lobby, which is perfectly for receptions, coffee breaks and exhibtions. Depend on the size of your event we offer our lobby in the first floor free of charge. Particularly the banquet hall and also the ballroom are to be highlighted. Each with about 400 sqm offers many variations for events like congresses, meetings, seminares and more. All our function rooms as well as the restaurant and the smoker`s lounge are located on the first floor. The maximum distance between the rooms is 30 meters. The whole function area is equipped with air conditioning. The "Festsaal" can be divided in the three rooms "Zehlendorf", "Steglitz" and "Lankwitz" and of course can be combined accordingly. Our function rooms "Zehlendorf" and "Lankwitz" has each a size of 98m² and has daylight available, are fully air conditionable. For your celebreties up to 35 Person our fireplace room "Kaminzimmer" (before "Jagdstube") is the perfect place. On our function floor with app. 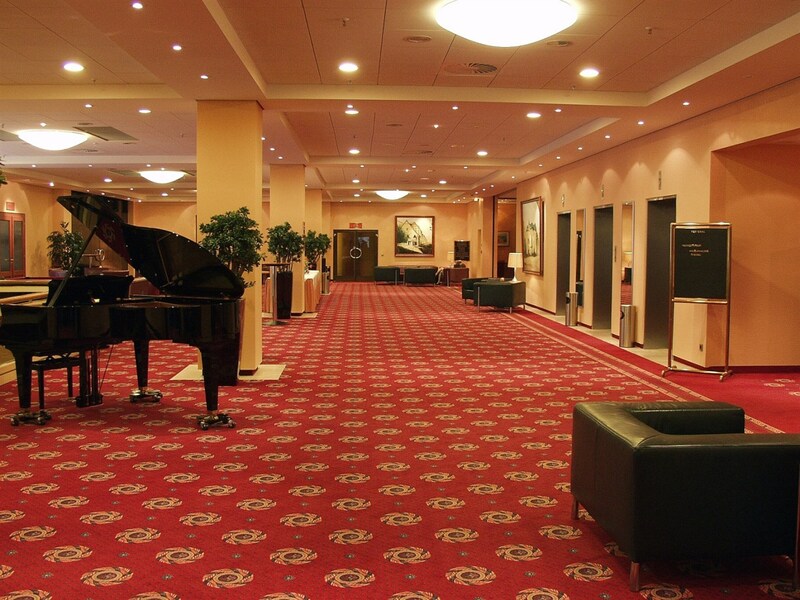 2.000 m² you will not only find seven function rooms for 8 to 500 persons, we also can offer a very big lobby, which is ideal for receptions, coffee breaks and exhibtions. Depend on the size of your function we offer our lobby in the first floor free of Charge. It is possible to rent the Schlosspark-Restaurant (120 seats) exclusively for your event.